How The Grinch Stole Christmas! holds a special place in my heart during the Christmas season. Not only have I been reading the Grinch for as long as I can remember, but the book is also a reminder I feel we need each year, as life seems to get a little frantic. The Grinch reminds us that Christmas doesn’t come from a store, but instead from the moments you create and share with your friends and family. In this post, you’ll find quick ideas and tips, tutorials, free printables and links. 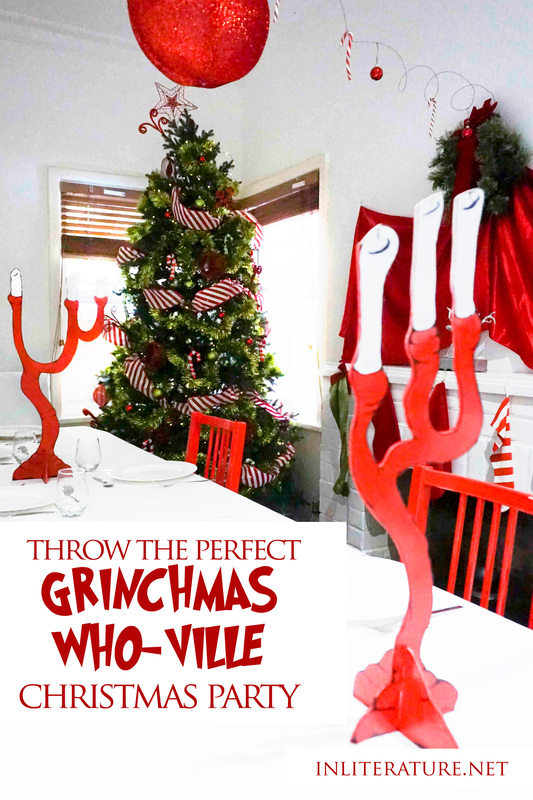 With your Who-ville party pulled together as smoothly as possible, you can focus on creating memories with those people special to you this Christmas. It’s time to start planning! Start by choosing your colour scheme/ Who-ville style. With How The Grinch Stole Christmas! written in the 1950s, you can choose to go retro, or childlike and playful. I took inspiration from Dr Seuss’ original illustrations drawn in red and white. I then tossed in a splash of Grinch green as a highlight. a wreath above the fireplace with red fabric draped and pinned behind, just like in the book. 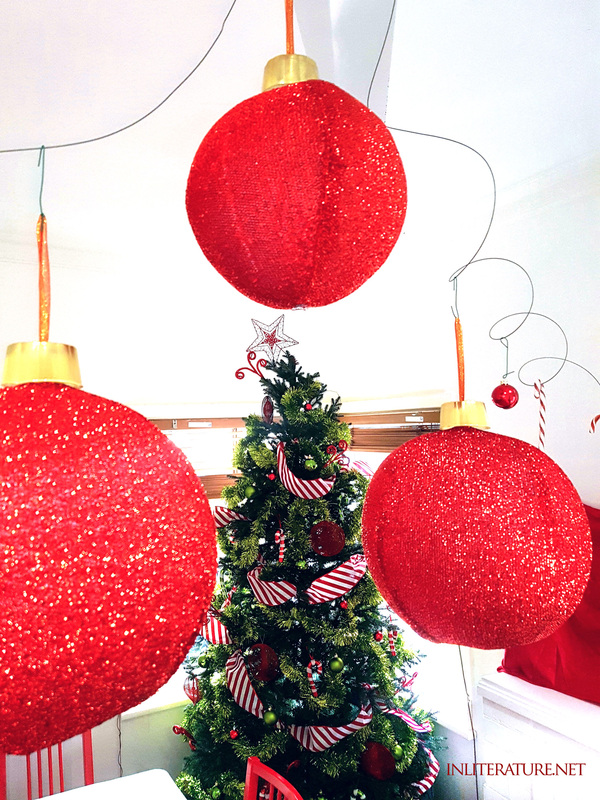 oversized decorations such as inflatable baubles (we purchased three from Kmart) hung above the table. Wire was looped, like in the book, and small baubles and candy canes were hooked. 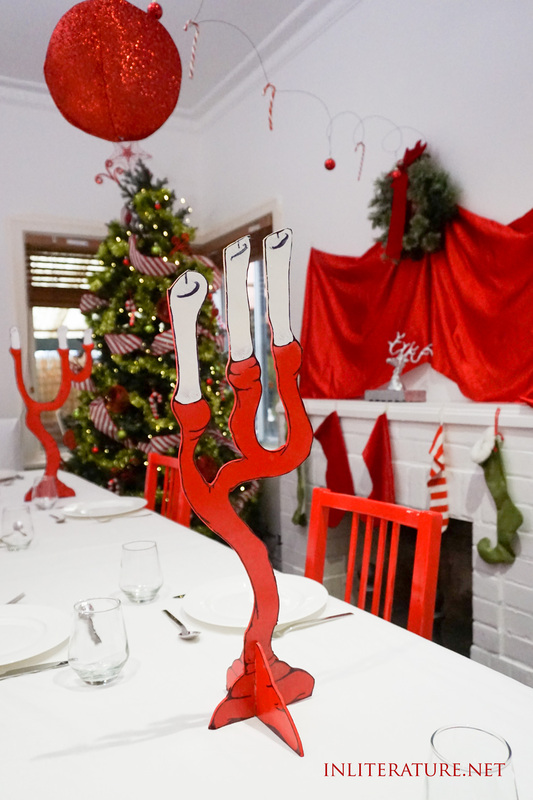 the Who-ville candelabra is the feature on the Who Christmas table in the book. a Who-ville Christmas tree. I walk through the different layers and decorations of the Who-ville inspired tree in this post. While not essential to the decor, these finishing touches made the room feel more authentic, like we were actually in a Who-ville home. 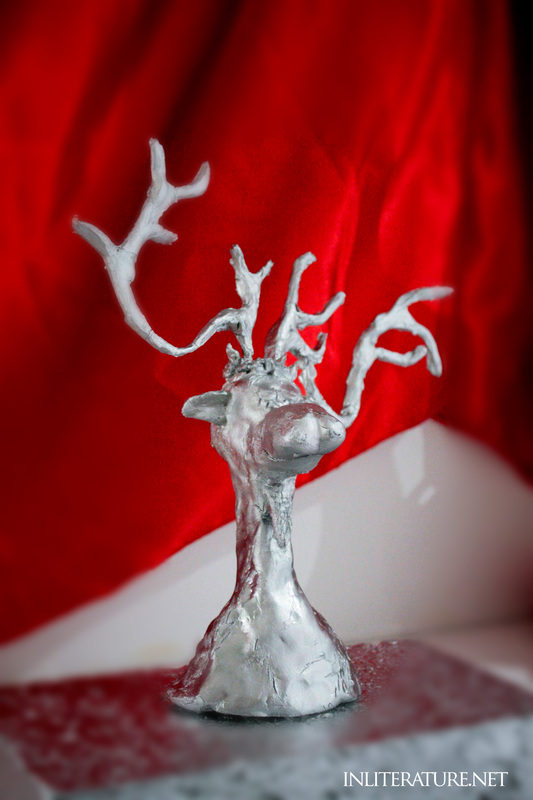 a Gack stocking holder— Gack being a Dr. Seuss animal, a cross between a reindeer/deer/moose, seen in One Fish Two Fish Red Fish Blue Fish. It seemed like a very Who-ville decoration to have! Bright red chairs. Old wood chairs heading to storage were given a coat of bright red spray paint and fitted with white chair covers. No Who-ville Christmas would be complete without a Who Roast Beast. In the book, the illustration of the Grinch cleaning out the icebox hints towards a pig-like creature. However, to make our job easier, we took inspiration from the live-action film with Jim Carrey. 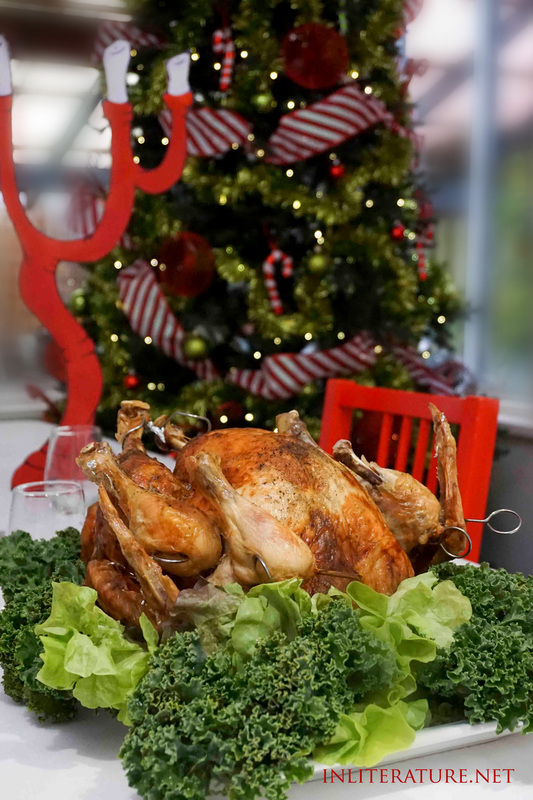 We took a turkey and used metal skewers to pin in extra chicken drumsticks on each side, creating a six-legged beast, before placing it in the oven to roast. Note: If you can find smaller metal skewers to hold the legs in, it’ll present nicer than ours! If you’re going to make your own version, I’d suggest sticking with the same meat type when constructing your beast e.g. poultry, or beef or pork, not a mix. Cook times may vary for different types of meat, and poultry and pork must be thoroughly cooked to ensure no one gets sick. 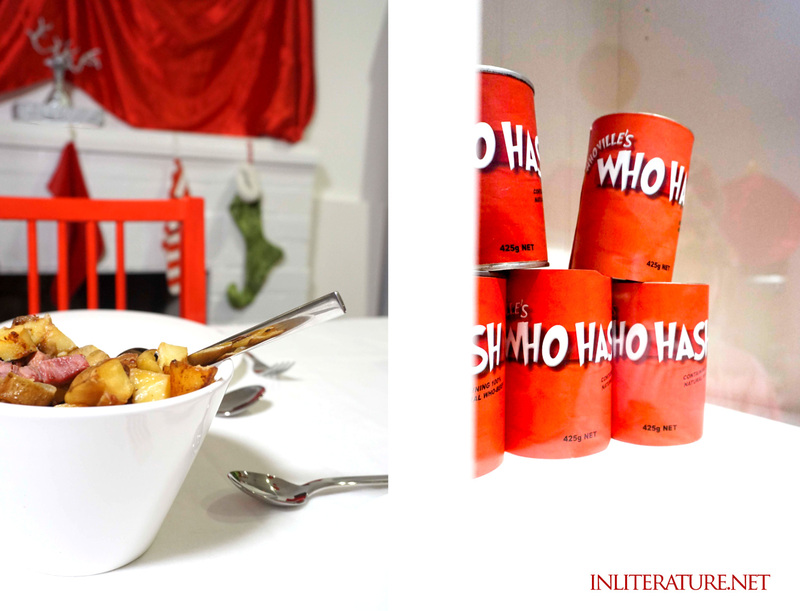 The Who Hash and Who Roast Beast were made from scratch, so store-bought pudding was used to keep the sanity! Food colouring was added to turn the vanilla flavour into a splash of red for Christmas. Retro 1950s dishes. Dr. Seuss wrote How The Grinch Stole Christmas! in the 1950s, so bring out the retro recipes. Molded salads were in, party pinwheels were served and Chex Mix was popular. Grinch coloured dishes. Short on time? 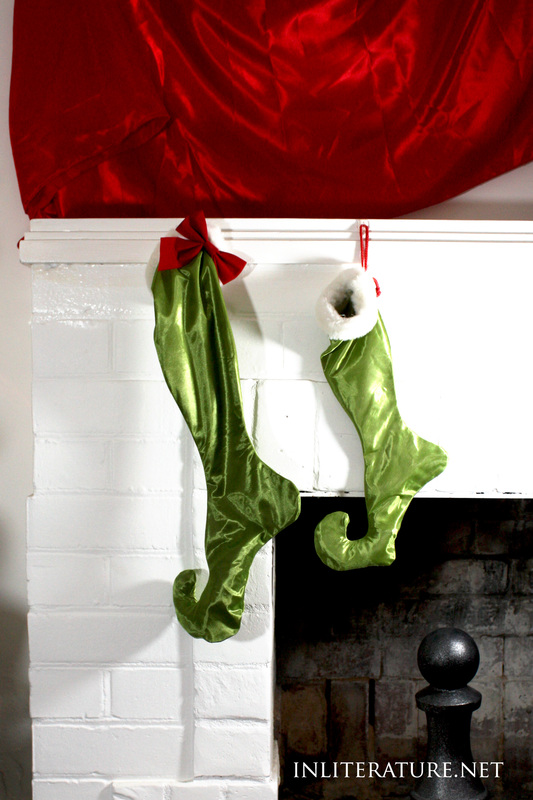 Green food dye turns all sorts of party treats into a Grinch themed buffet. Madi made Grinch krispie treats, green cheddar scones and cupcakes with green frosting. 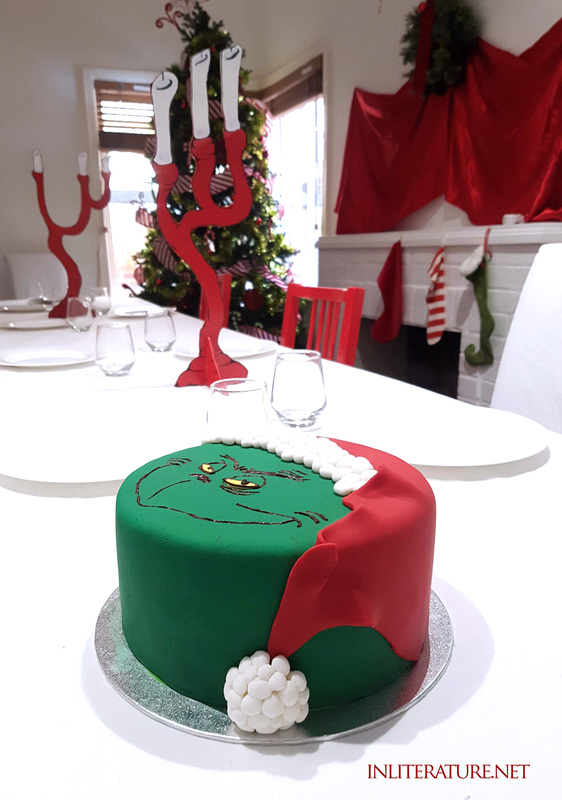 For the cake (since our party was actually a birthday), we bought a Grinch-themed cake to finish off our dessert menu. Just do a Google search for Grinch food or Grinch cakes for a load of ideas! Beverages. There are some great Grinch punches and cocktail recipes available online– do a Google search to find them. 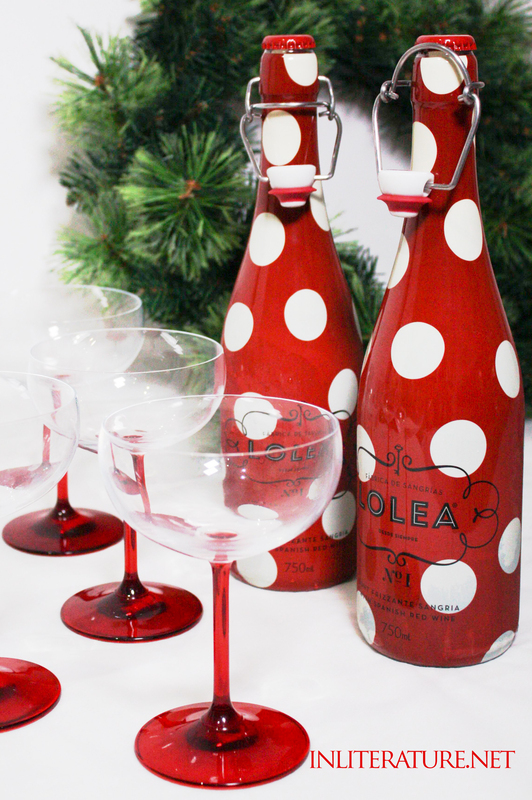 For us, I bought sangria in these retro polka dot bottles to match the playful colour scheme [A Spanish brand, you’ll find Lolea sangria in Australia, the US, UK and Canada]. 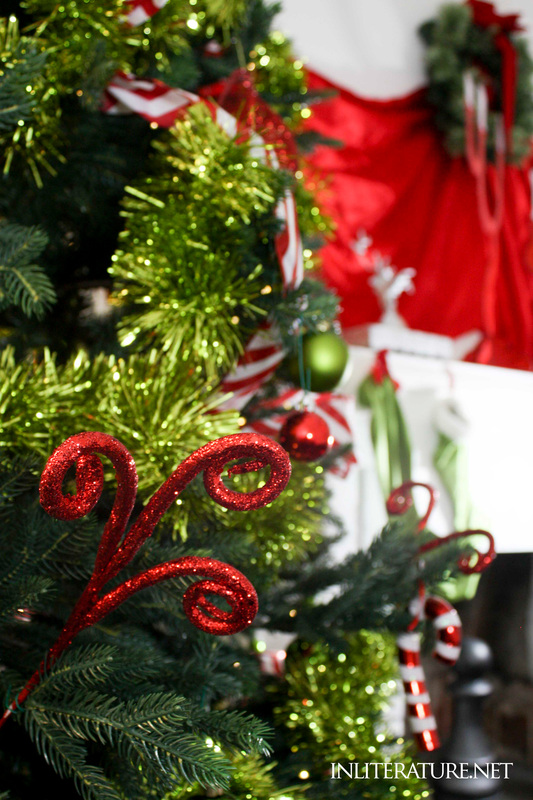 Would a Who-ville party really be complete without a Cindy Lou Who or Max the Dog? She then finished off her hair by searching for a tutorial on how to create fake bangs. Her costume was a pink nightgown we found at the op shop. For photos, we finished her look off with an oversized Kmart bauble. Of course, there are quick ways to create a Who costume for those short on time. Use tree picks for hair decorations. Glue gun Christmas decorations to a headband. 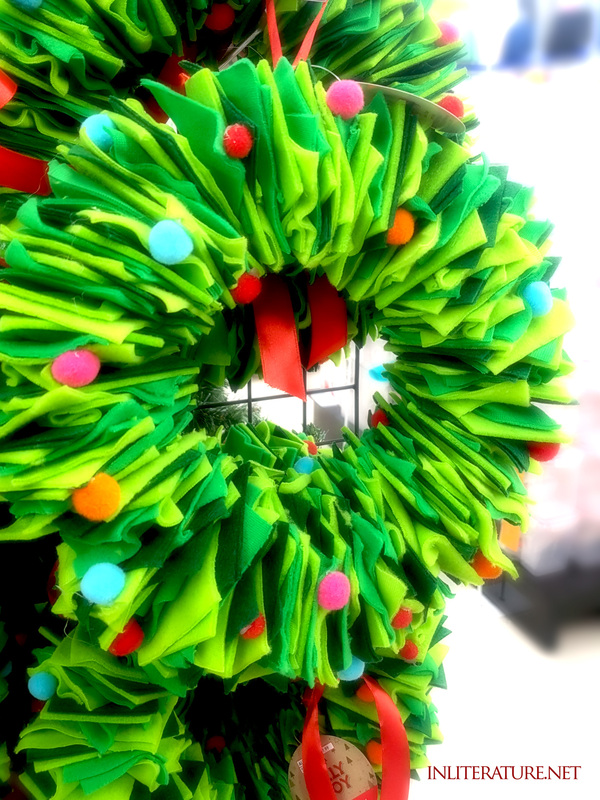 Make big bow ties in funky patterns for the men using extra wide Christmas ribbon. Hit the op shops! You’ll find an array of clothing in big patterns or bright colours for a few dollars. 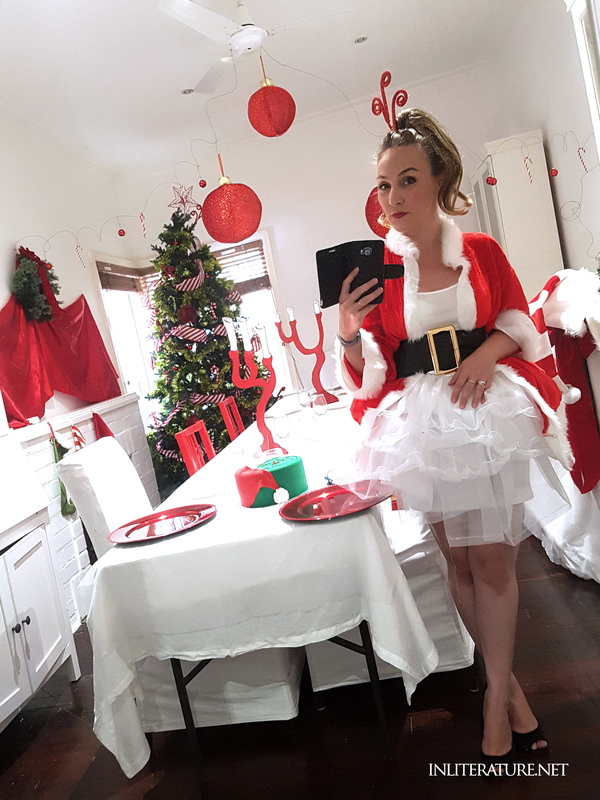 While not as fabulous as Madi as Cindy Lou Who, I took inspiration from Martha May Whovier from the live-action film and tossed together a quick costume. Grabbing a cheap oversized Santa outfit, I cut the top down the front to create a Santa coat. Wearing a white slip, I popped on a white tutu on top, then another layer of crinoline– a type of thick nylon mesh– to make the dress really flare out. To turn the crinoline fabric into a skirt within minutes, I wove metal wire from the hardware store through to create the waist, then twisted the ends together. Whatever works! To cinch my waist, I finished off with the Santa belt from the Santa costume kit. To style my hair, I attached a clip-on wig piece to my ponytail to create the height, then stuck one of my tree picks in for the finishing hair piece. Ready to go in minutes! There will be some who want to go all out and create those oval shaped Who-ville bodies. For a quick fix, a tutu allows fabric to drape away from the body, creating an oval body shape. If you’re taking this Who-ville costume really seriously, Children’s Theatre Company shows their process here. 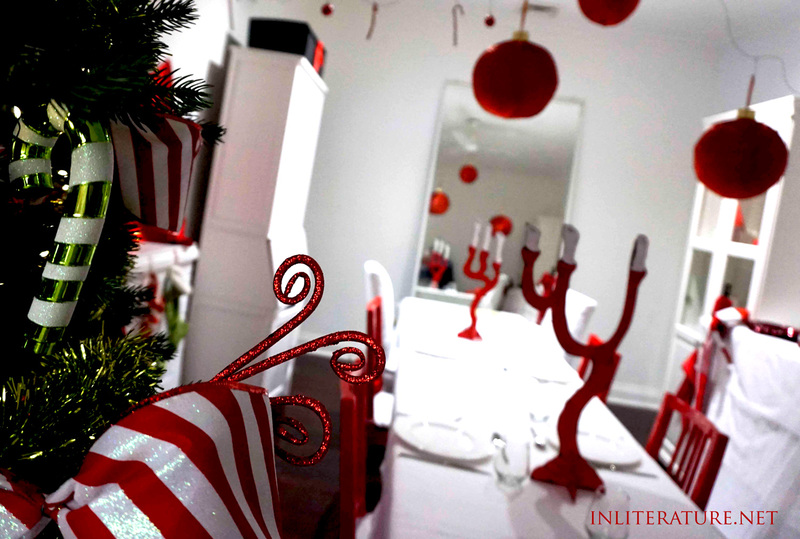 With your home looking like a Who-ville home, your menu ready to serve, and the host decked out as a Who, your party is ready to go! 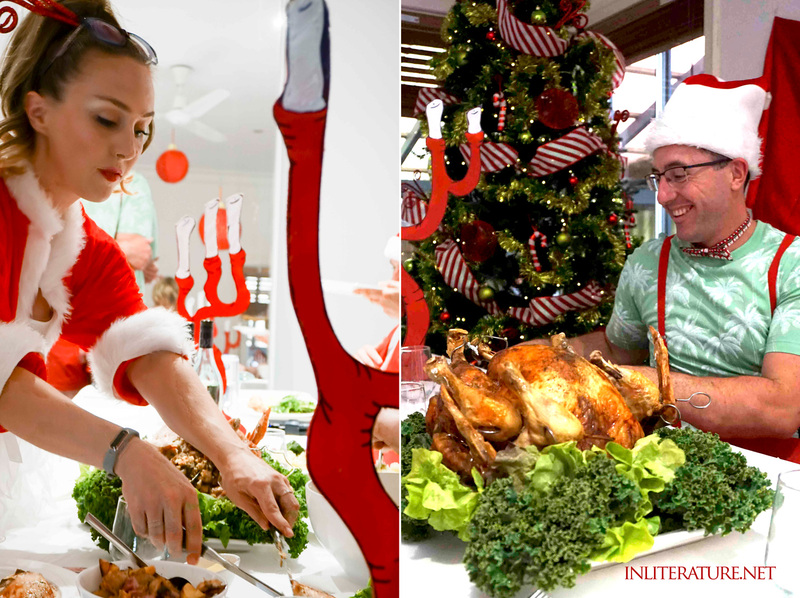 If you throw a Who-ville party, whether it’s a small gathering of your friends or an all-out Christmas feast, I’d love to see your photos! Tag me on Instagram @brytontaylor.